Catch the bus from Stop E at the GPO Elizabeth Street bus mall which is near the corner of Macquarie Street. Ask the driver to set you down at Ogilvie High School, stop 19, on Main Road, Moonah. Walk in the same direction the bus is travelling, turning into the first street on your left which is St. John's Avenue. The gatehouses at the entry to this street mark your entry into the St. John's Park Precinct. Follow 'Hobart' signs onto the Tasman Bridge, moving into the left lane. At the end of the Tasman Bridge take 'Glenorchy' turnoff. Follow 'Glenorchy' signs onto the Brooker Highway, keeping in the left lane. At the first major intersection with traffic lights turn left into Risdon Road. Turn right into Main Road at the first major (traffic light controlled) intersection. Take the first street on your left which is St. John's Avenue. The gatehouses at the entry to this street mark your entry into the St. John's Park Precinct. Head north on the Brooker Highway. After passing under the overhead bridge at New Town move into the left lane. At the next intersection turn left into Risdon Road. At the intersection with traffic lights turn right into Main Road. Take the first street on your left which is St. John's Avenue. The gatehouses at the entry to this street mark your entry into the St. John's Park Precinct. It may be approached from "Maypole Corner", (intersection of New Town and Risdon Rds & Forster St.) From here, head along New Town Rd towards Moonah. St Johns Ave is the 1st turn on the left. If you pause here, you will notice 2 gatehouses on either side of St Johns Ave. At the end of this avenue you can see the tower of St Johns church. The headquarters of the Friends of the Orphan Schools is in the Old Sunday School, labelled as "10. Parish Hall" in the above map. All tours and most events start here. To reach it, turn into St John's Avenue from the Main Road and travel to the end, about 300 metres. Turn left and travel a further 60 metres and then turn right into a narrow road. 50 metres ahead you will find a car park on your left. At the back of this carpark is the hall, a small sandstone building that looks a little like a baby church. 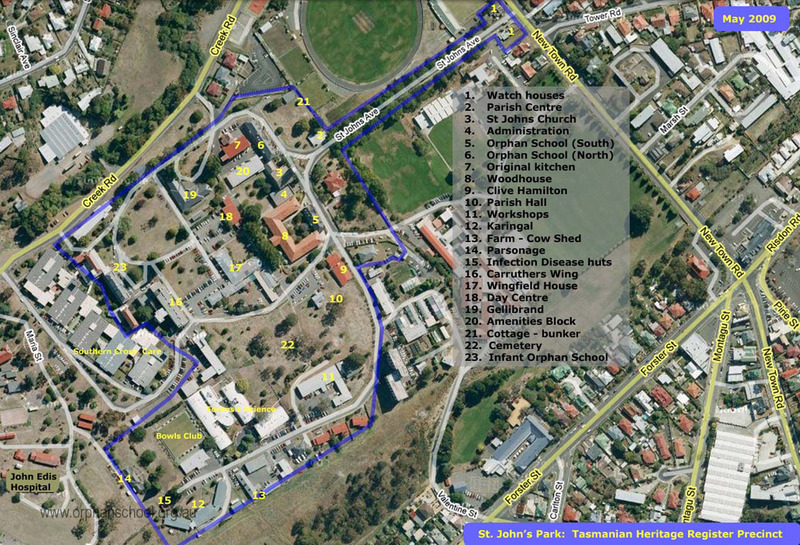 After hours there is ample parking space available in front of the Old Sunday School but St John's is a working precinct and car parking is at a premium on business days. Parking spaces are usually available near the church end of St Johns Avenue.